This isn't a particularly low-fat recipe, but the fat it does contain is largely of the good kind. Avocado contains lots of monounsaturated fat (and comes with loads of fibre, potassium and vitamin E). Olive oil is also high in monounsaturates and has lots of omega-3 and omega-6. Preheat the oven to 150°C, gas mark 2. Cut two garlic cloves into matchsticks. Submerge one of these matchsticks into the pulpy part of each tomato half. Place in a non-stick oven dish and sprinkle with 1 tbsp olive oil. Place in the oven and cook for 45 minutes until they're caramelised (check frequently so they don't go too brown), then set aside. Mix the vinegar with 2 tbsp olive oil and season with salt and freshly ground black pepper. Toast the bread on a griddle pan, rub with garlic and drizzle with the remaining olive oil. 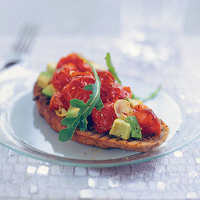 Toss the avocado with tomatoes and roquette and divide between the bread. Spoon the dressing over the top, sprinkle with pumpkin seeds and serve.